Bred in Turkey to protect herds. They keep away the Mountain Lions, Bobcats, and Coyotes on the PGE property. 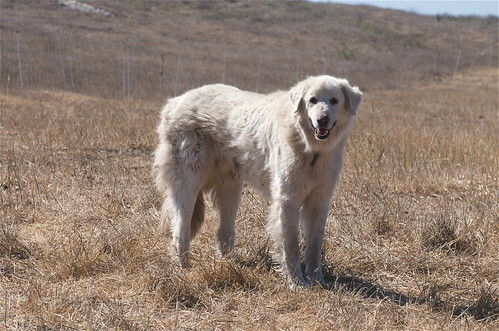 These dogs can weigh up to 180 lbs and are hard to see until they are on their feet, as they blend in with the sheep when lying down. They are said to be trained to either kill the threat or to chase them to the edge of the fence. So, you have a 50-50 chance if they charge, and you better hope for plan B.